December 6, 2012 - After a decade as an international fugitive, Canadian citizen Rebecca Rubin gave up life on the run last week when she turned herself over to the FBI at the international border in Washington state. The 39-year-old alleged member of the domestic terrorist cell called “The Family” will face federal arson charges for her role in the largest eco-terrorism case in U.S. history, known as Operation Backfire. With Rubin in custody, only two Family members remain at large. Along with a dozen other conspirators, Rubin is charged with multiple crimes from 1996 through 2001 in the West and Pacific Northwest, including in Oregon, Colorado, and California. The Family committed an estimated $48 million worth of arson and vandalism under the names of the Animal Liberation Front and the Earth Liberation Front. The cell’s most notorious crime was the 1998 arson of a Vail, Colorado ski resort that caused more than $24 million in damages and drew international attention to eco-terrorists—those who break the law in the misguided attempt to protect the environment and animal rights. The FBI took the lead in the Vail investigation, working closely with local, state, and federal law enforcement partners, and in 2004, multiple eco-terrorism investigations were condensed into Operation Backfire. In July 2011, one of Rubin’s conspirators, Justin Solondz, was turned over to U.S. authorities by the Chinese government. Solondz had been imprisoned in China on drug charges. That leaves two Operation Backfire fugitives still at large, and there is a reward for information leading to their arrest. 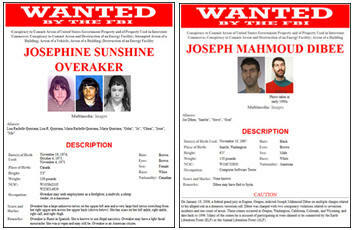 “Two years ago we had four fugitives. Now we have two so we are halfway there,” said Special Agent Tim Suttles, who works in our Portland Division and has been investigating the eco-terrorist group since 2005. Although Suttles said it is “very satisfying” to see Rubin surrender and submit herself to the judicial process, the Operation Backfire investigation will not be closed until the last two fugitives Joseph Dibee and Josephine Overaker are in custody.